Pearl, the Rosewood London Hotel’s pet dog, seems to have the right idea. Lazily slumped in her comfy basket in the glamorous lobby surrounded by all her toys, she could have been a stand-in for me in my hotel room a couple of hours previously. Admittedly, Pearl’s toys are a lot less impressive than my pair of 52” flat screen televisions with full surround sound audio, a Geneva digital radio system with docking station, hi-definition streaming WIFI, a complimentary personal bar with snacks and non-alcoholic beverages and a grand Nespresso coffee maker. Come to think of it, her basket is simply no match for my 68 sq metre Executive Suite with a king bed covered in Rivolta Carmignani Italian linens. That said, the bathroom is probably the stand-out for me; a marble walk-in shower of Wembley Stadium proportions dwarfing a separate bath area, with a clutch of very fine Czech & Speake toiletries to pamper myself with. The only puzzle for me is the toilet, hidden away from the bathroom at the opposite end of the room. A long walk for a late night visit should the need arise. 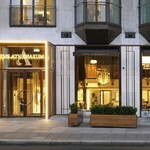 The Rosewood London Hotel sits proudly within what was once the grand headquarters of Pearl Assurance in High Holborn. 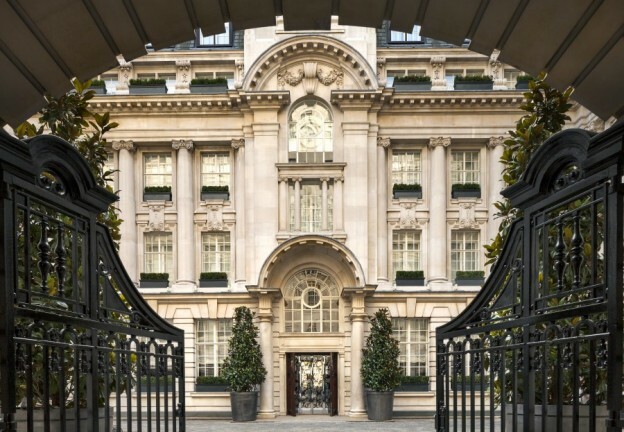 A vast Edwardian grade II-listed monument to the British Belle Epoque era, complete with wrought-iron gates leading to a central carriage courtyard fringed with vintage gas lamps and marble staircases under a seven-storey cupola. But this is where the history lesson ends. 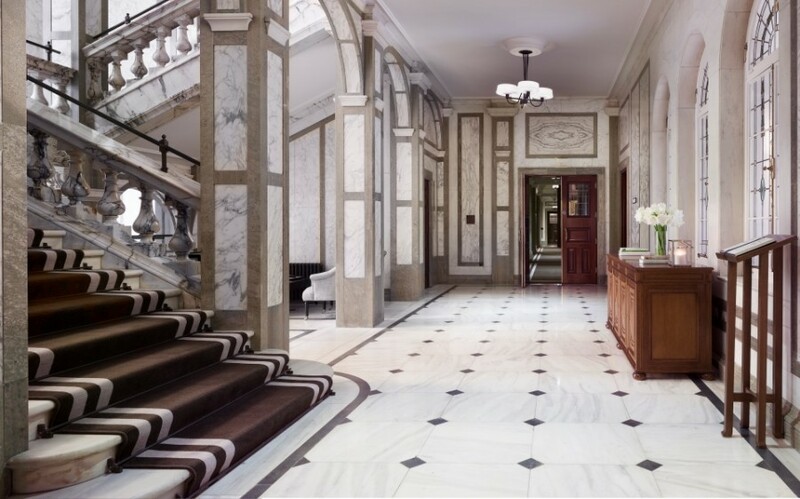 The opulent interiors courtesy of uber interior designer Tony Chi are almost as extraordinary as the building’s history. It is a design masterpiece of how the contemporary can hold hands with the past in equal measure. Not unlike The Corinthia Hotel, which recently breathed new life into the old Ministry Of Defence building on London’s Whitehall. 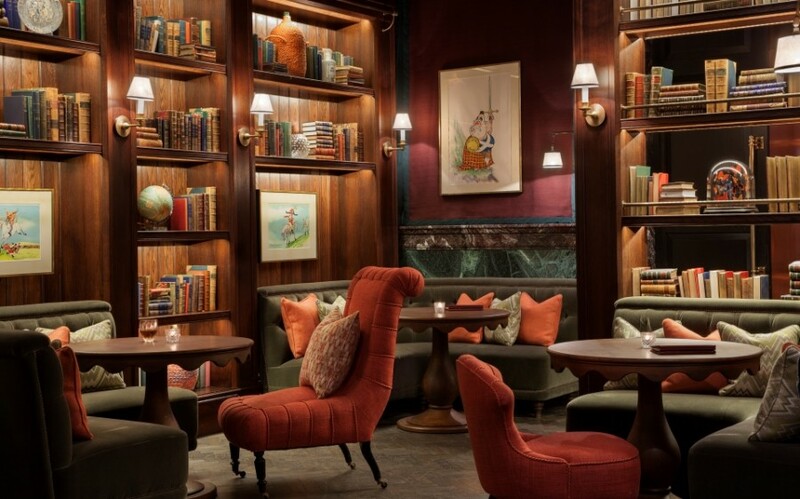 There is a distinct art and literary theme going on here, from the quirky British bulldogs and gilded bird cages in the lobby to wall art from more traditional sources and enough books to keep reading in the hereafter. There’s even an homage to James Gilray and Gerald Scarfe, two legendary caricaturists forming a bridge of satire across different centuries. The latter perhaps coming off better with the hotel’s signature bar named after him. Scarfes Bar, (I’m convinced there should be an apostrophe in there) with its original Scarfe artworks and live jazz every night, has become a popular watering hole with the Holborn Midtown set. While we’re on the subject of themes I’m a big fan of the Rosewood staff wardrobe. 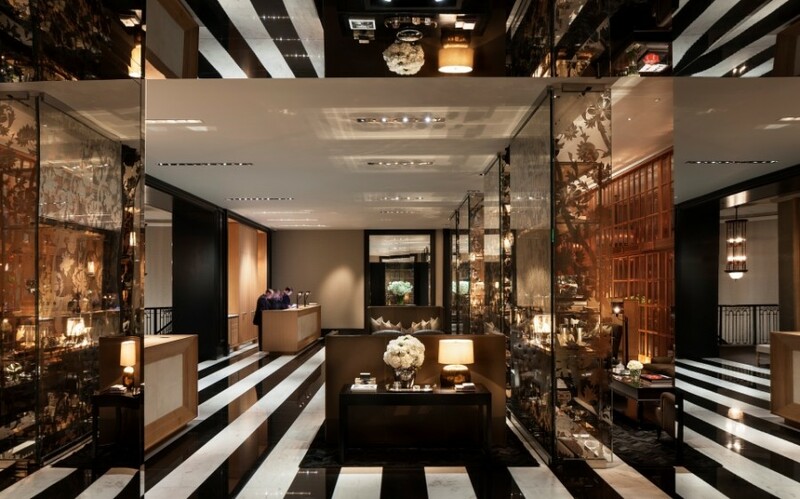 The outfits are perhaps the sharpest in the hotel industry; tartan and leather elbow pads for the lobby, more subtle tartans for the restaurants and lobby. Downstairs, a wooden walkway over a pebbly stream connects reality to the Sense spa. It’s an oasis of calm and tranquillity and I can already feel my ying and yang overloading with therapeutic possibilities. Sadly, I have no time for such indulgence on this visit, save for a sauna and steam session in separate his and hers facilities. 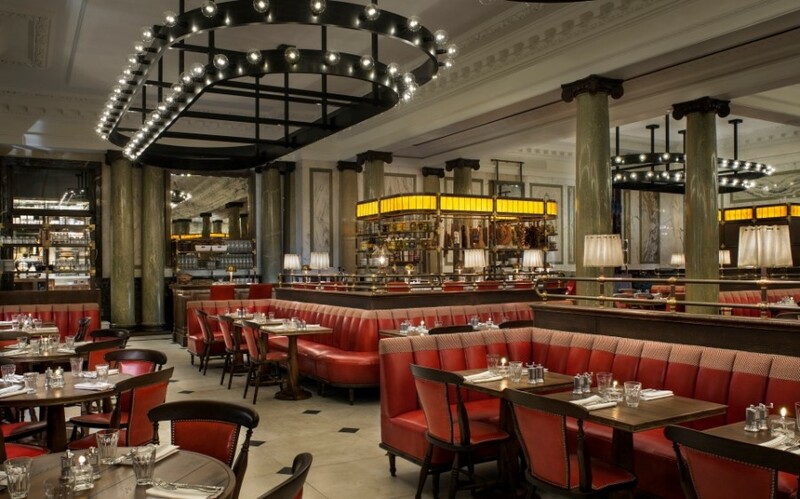 Back upstairs, the Holborn Dining Room, with its red leather banquettes and copper-topped bars, is a study of marble columns and art deco. 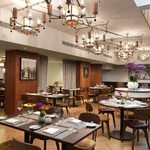 It’s a bustling brasserie lauded over by Executive Head Chef Calum Franklin and positively revels in high-quality British cuisine, from roast Suffolk pork belly to pot roast lamb breast. The food is excellent, but be warned, it can get noisy at weekends. Franklin is also putting his pastry skills to good use with a soon-to-open gourmet pie room with, it is rumoured, a choice of over 200 pies. Talking of numbers, there is an impressive gin bar here too; over 500 gins and 30 tonics combine to offer 14,000 possible pairings. Said to be the biggest choice in London, a darting mischievous thought tells me to try them all, but common sense prevails and the two I try don’t disappoint. The new day dawns and breakfast beckons in the Mirror Room; a vast space, yet it feels more like a living room in a country pile with leather settees and cushions and lacquered wood tables. At the far end of the room, a table laden with huge tins of real teas awaits, brews of blends familiar and unknown. This is tea heaven, ultimately finding its way to my table within a teapot of some magnitude. Unusually, there is no breakfast buffet on offer, instead, the table service a la carte ensures the food is freshly prepared. That said, I always feel a good quality buffet allows me to hand pick my breakfast at my own pace with my own fruit preferences. 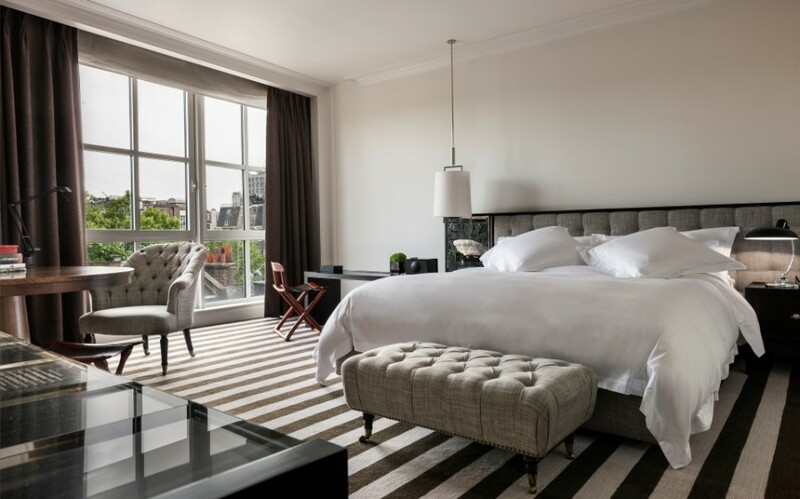 The Rosewood London Hotel brings elegance and luxury living to Holborn. It’s an area of London that has long needed something to brighten it up despite it being so close to the trendy spots of London’s theatre district. As I depart through the lobby, Pearl is once again curled up in her basket. It has been a long time since I envied a dog’s life. 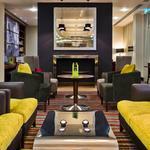 Rooms from £495 per night.